Pitt Farms is located in Ames, Iowa and is maintained by farm founders John and Marytha Pitt. They have been farming for the past 35 years in both grain and cattle. 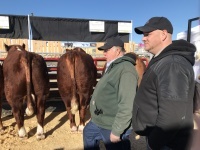 Pitt Farms specializes in breeding and caring for Polled, Registered Hereford Cattle. The docile demeaner and versatility of the hereford breed has made working with them a rewarding endeavor. All herefords bred on our farm are polled and registered through the AHA. 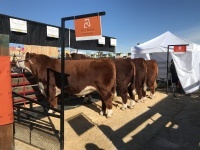 Each hereford heifer is carefully chosen and bred to maintain or improve the quality of the hereford breed standard. In addition to our traditional breeding/calving schedule, we use AI and Embryo Transfer methods to improve our herd. Bull leasing options are also available.